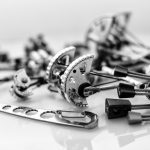 Gear, climbing moves, methods and terrain features all have their names. ANCHOR Any device or method for securing a climber to a rock face to prevent a fall, hoist a load, or redirect a rope. ARETE An acute edge formed by two intersecting planes of rock. Can be blunt and rounded or sharply defined. The corner of a brick building is a good example of an arete. ARMBAR Arm position formed by pressing a palm against one side of a crack with the elbow against the other. Used for climbing squeeze chimneys and offwidth cracks. BACKCLIP A dangerous, incorrect method of clipping a quickdraw where the rope runs from the outside of the draw inward instead of the proper inward-to-outward method. A backclipped rope can unclip itself. BACKSTEP Using the outside edge of a foot to stand on a hold. BELAY LOOP A sewn loop on the front of your harness that a belay device is clipped to for belaying or rappelling. BELAY/RAPPEL DEVICE The device through which the rope is passed and clipped to the harness with a locking carabiner. 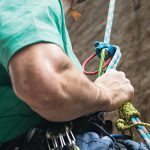 Creates manageable rope friction to both belay a climber and rappel. 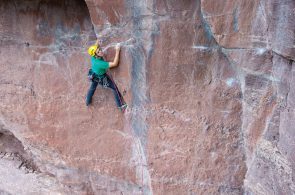 BETA Tips on how to do a climbing sequence, as in, “There’s a jug off to the left above the third bolt.” Usually told to you by someone who has done the route or problem. BIGHT A loop of rope that does not cross over itself. BIG WALL An especially high cliff that requires multi-pitch climbing and usually takes multiple days to ascend. BOLT Permanent protection drilled into the rock. Most commonly used as sport-climbing protection and for belay and rappel anchors. BRAKE HAND The dominant hand, used to prevent the rope from sliding unchecked through a belay device. When you belay, the brake hand never lets go of the rope. CAM Spring-loaded protection device that, when a trigger is pulled, the cams retract and can be inserted into cracks. When the trigger is released, the cams expand and lock into the crack. When properly placed in solid rock, a cam offers easily removable and bomber protection. CARABINER OR ’BINER Aluminum snap link used for myriad tasks, the primary one being to connect the rope to the anchor. CHALK Magnesium carbonate powder applied to hands to keep them dry and improve grip. CHIMNEY A crack wide enough for a body to fit inside. CHOCK A wedge-shaped piece of protection that slots into the constrictions of a crack, like a cork in the neck of a wine bottle. CRIMPER Small edge just wide enough for fingertips. One “crimps” on a crimper. CRUX Hardest section of a climb. DIHEDRAL Any open-book formation. Also referred to as a “corner.” Opposite of an arete. DIRECTIONAL Protection placed to prevent a following or toproping climber from swinging on a route that involves a traverse or overhang. DROP KNEE Body position performed by placing the foot’s outside edge or toe onto a foothold, which is off to the side, while rotating the hips so the knee points downward. DYNO A“dynamic” move, often a jump, that allows a climber to gain a distant hold. EQUALIZED An anchor that equally distributes weight to each of its protection points. 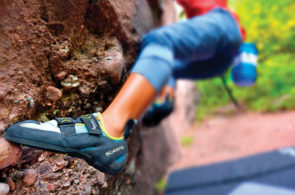 FACE CLIMBING Using features such as knobs, edges, slopers and tufas. Different from crack climbing, where you obviously insert your hands and feet into a crack. FALL FACTOR A formula-derived number representing the severity of a fall. Calculate it by dividing the length of a fall by the amount of rope in play. FINGER CRACK A fissure the size of a person’s fingers, from fingertips to knuckles deep. FINGERLOCK Camming fingers into cracks. There are a variety of fingerlocks, used for different crack sizes. FIST JAM Jam used for fist-sized cracks, accomplished by wedging a fist into the crack. FIXED PROTECTION A permanent piece of gear for anchoring into a wall. Usually a bolt or piton. FLASH Climbing a route on the first try (with prior knowledge of the moves; i.e. after watching another person climb the route, or given beta). GASTON Method for utilizing a sidepull by pressing with the fingers or hand in a thumb-down position, and by pushing in the opposite direction with the feet. HAND CRACK A crack wide enough to accept an entire hand, but not so wide it requires a fist jam. HAND JAM Technique used to climb hand cracks by slotting/camming a cupped hand into a crack. HEEL HOOK Foot technique where a heel is applied to an edge/ foothold. Especially useful on overhangs, traverses and aretes. HIGHBALL A high, dangerous boulder problem. HUECO SCALE Also known as the V-scale, invented by John Sherman, a.k.a. “The Verm,” hence “V.” The standard method in America for rating the difficulty of a boulder problem. KNEEBAR Locking the lower half of your leg in a gap by pressing with the knee and pushing with the foot against two opposing rock features. LAYBACK Technique of pushing on a face with the feet while pulling with the hands on an opposing edge or crack. LEADER The climber who goes up first, clipping his or her side of the rope through protection using carabiners or quickdraws. LOCKOFF Supporting your body in a fixed position with one bent arm, usually while clipping or reaching for another hold with your other arm. MANTEL Moving onto a shelf of rock by pressing down on it with one or both palms until you are able to stand on the “mantel.” Like getting out of a pool. MONO Short for “mono doigt.” A pocket with room for a single finger. OFFWIDTH A crack too wide for fist jams and too narrow to be a chimney. ON-SIGHT Climbing a route without falling or resting on gear, and with no prior beta or knowledge of the moves. PERMADRAW A steel cable, usually four to six inches long, with a screwlock carabiner on the bolt end and a regular carabiner on the clipping end. These are permanently fixed to bolts, and popular in heavily trafficked crags such as Rifle Mountain Park in Colorado. Permadraws make climbing and lowering convenient and efficient since you don’t have to fiddle with placing or retrieving your own quickdraws. PITCH The distance climbed to reach an anchor point or belay stance. Multi-pitch climbs are found on cliffs taller than one rope length. A single-pitch route requires only one rope length. PITON Iron spikes (aka “pins”) of various sizes and shapes that can be hammered into cracks and clipped for protection. These are rare on sport routes. PROTECTION OR PRO Equipment placed in the rock to catch a climber’s fall. QUICKDRAW OR DRAW Two carabiners connected with a short sling, or runner. Used to attach the rope to a piece of protection. RACK A generic term for the collection of gear you are taking up on a climb. Usually composed of slings, protection, quickdraws, carabiners and other equipment for getting up and back down. ROPE DRAG The friction that weights a rope due to its running across the rock and through protection. Clever rope and pro-placement techniques can lessen the drag. RUNNER A sewn or tied sling of webbing of various lengths, though typically 24 inches long. RUNOUT The term for being far above your last piece of protection. 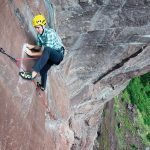 SEND Term for climbing a route without falling or resting on gear. SHOCK LOAD A force exerted on an anchor when weight is suddenly dropped onto it. 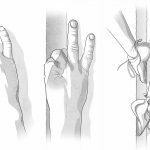 SIDEPULL Method for gripping a vertical edge that entails pulling with the hand and pushing with the feet. SLOPER A hold that must be gripped with an open hand because of its sloping nature. SMEAR Friction-dependent foothold, where the ball of the foot is “pasted” over a textured or lower-angled surface in order to gain purchase. STEM Technique for climbing opposing corners by holding oneself in place by pushing in opposite directions with the feet and hands, usually done in a chimney. STICK CLIP A specialized pole for placing a quickdraw (usually with the rope pre-clipped) into the first bolt of a sport climb. STOPPER KNOT A knot in the end of your rope that prevents a belayer from lowering a climber off the end. Also used to stop a climber from rappelling off the end of a rope. TAKE The command used to alert a belayer that the rope is about to be weighted. A belayer “takes” in the rope tightly. TOE HOOK Wrapping the top of the foot up or around a rock feature. TOPROPE When a climber has the security of a rope from above. A slingshot toprope is when the rope runs from a climber through overhead anchors and back down to a belayer positioned on the ground. TRAVERSE Moving laterally over a section of rock during a climb. UIAA The International Climbing and Mountaineering Federation. 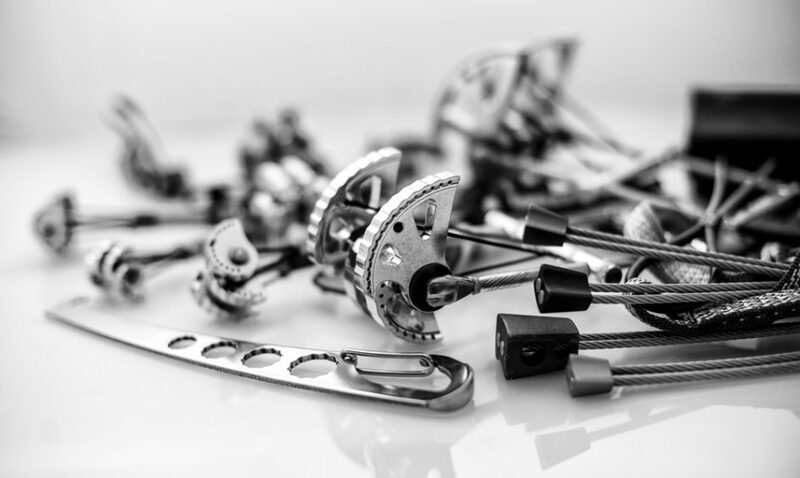 This organization governs the safety standards on climbing equipment. UNDERCLING Pulling up on a down-facing hold. Z-CLIPPING A clipping mistake where a climber pulls a length of rope up from below their last-placed placed piece of protection and then clips their next piece of gear. Climbing is a purist’s pursuit. Just you and the wall. Mostly. And a litany of gear.